Today I am working on the binding of a baby quilt. The requested navy blue is difficult for my old eyes to see. But I am winning. I have the binding cut, pressed and rolled up. The label is embroidered and attached to the back, but I won't show that as it contains personal information for the recipient. As always, I watched my own video to remind myself how to cut the bias binding. Here it is for your convenience. Today I have Spanish class and Exercise group to attend. Those will take up my afternoon. Maybe I can get the binding sewn on this evening. Have a great day. Smile at a child, smile at an older person, smile at people who just look like they need a smile. For the left-handed quilters here is the video flipped so it "looks" left handed. I have old eyes also. . . and find that the going is better for me with dark fabrics during daylight. 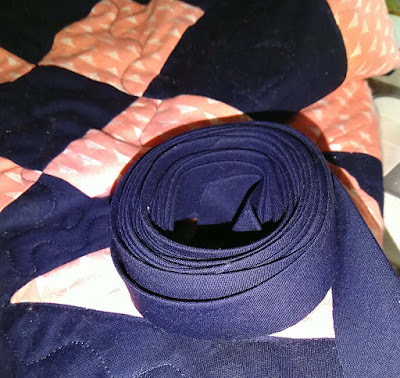 Trying to sew black and navy fabrics at night is always difficult, no matter how many lights I have turned on around me. What did we ever do before YouTube? I feel your blindness, even with my glasses. The light has to be BRIGHT! Ah, eyes! A challenge we all have either experienced or can expect. Hope you’ve made progress in spite of a full day yesterday. There’s always tomorrow! I've never done bias binding (yet). I saved your video to my Quilting Tutorials Pinterest board for future use. Thanks.